As an indoor solution, these traditional-style mailboxes are most popular with University housing managers, and they help keep your mail area organized. The 1700 series rear-loading mailboxes contain modules that provide a lot of compartments in a small space, and are not constrained by postal installation regulations. 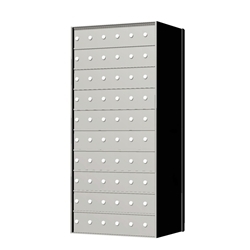 The 1700 series mailboxes are private delivery and therefore have no minimum or maximum mounting height requirements. Height: Rough Opening Height is 55-1/4"
Width: Rough Opening Width is is 26-3/16"
Features an all aluminum construction. The mailbox comes standard with a clear anodized aluminum finish or powder coat dark bronze finish. Rear loading for full in wall mounting and installation. Tenant mail retrieval from the front of the mailbox and private delivery from the rear of the mailbox. Optional rear cover with private lock available. Tenant doors include a 5-pin cam lock with two (2) keys each. Attractive number slot with paper cards for identification. Each tenant door includes a clear plastic window with a metal backplate and card for tenant number identification and labeling in the field.